League Week: | Hopkins US#5 JT! Brown US#6 TJ! 9 PA#1s (Coley in 100&300H) - Ryan, McCloskey US#10s! Langston Northern of Stroudsburg won the 100 (10.73) and 200 meter dashes (22.17). John Wathen of Pleasant Valley won the 1600 (4:34.99) and 800 meter runs (2:01.35). Stroudsburg won the 4x100 (42.93) and 4x400 meter relays (3:31.82). Dwayne Vines of Pocono Mountain West won the triple jump with a mark of 45-5.50. Stroudsburg scored 221 points to win the team title. For the girls, Stroudsburg swept all three relays, running 50.81 to win the 4x100 meter relay, 4:13.01 to win the 4x400, and 9:50.20 to win the 4x800 meter relay. Erin Madison of Pocono Mountain East won both hurdle events, running 16.16 to win the high hurdles and 46.43 to win the intermediate hurdles. Gwendolyn Remaley of Lehighton won the shot put (36-11) and the discus (102-2). Stroudsburg scored 166.5 points to win the team title. Seth Worthing of Bellwood Antis won the 100 (11.42) and 200 meter dashes (22.61). Teammate Jeremy Claypoole won the long jump (20-8.75) and the triple jump (44-11.75). Zach Sinisi made it three double winners for Bellwood Antis, winning the 110 meter hurdles (15.96) and 300 meter hurdles (40.91). Bellwood Antis scored 162 points to win the team title. For the girls, Maria Snyder of Northern Bedford completed the distance triple, running 5:21.29 to win the 1600, 2:24.75 to win the 800, and 11:44.89 to win the 3200 meter run. Alana Saulen of Mount Union Area won the 100 (13.20) and 200 meter dashes (27.37). Nicole Leonzo of Harrisburg Christian won the 100 (13.38), the 200 (27.03) and 400 meter dashes (1:01.12). Kennedy Shank of Northern cleared 11 feet to win the pole vault. Kameko Webb of Bishop McDevitt won the long jump (15-7) and the triple jump (32-3). For the boys, Bobby Smutsky of Northern ran a facility record time of 49.92 to win the 400 meter dash. Cameron Shirk of Harrisburg Christian won the 1600 (4:36.88) and 3200 meter runs (10:27.77). Dakota Matthews of Big Spring won the javelin (157-2) and the shot put (48-2.50). Summer Hill of Honesdale ran 5:03.14 to win the AAA 1600 meter run. Cassidy Jenkins of Lakeland ran 45.45 to win the AA 300 meter hurdles. Honesdale ran 4:00.68 to win the 4x400 meter relay. Jenn Slagus of North Pocon threw a PA#3 mark of 137-1 to win the discus. For the boys, Rico Galassi of Holy Cross won the 1600 (4:19.19) and 3200 meter run (9:39.28) in AA. Rian Fowler of Delaware Valley ran 49.73 to win the AAA 400 meter dash. Robert Castellani of Valley View threw 182-4 to win the javelin. Devon Strubert of North Pocono cleared 6-6.25 to win the high jump. Stefan Moreau of Uniter won the shot put (50-7.25) and the javelin (168-8). Ligonier Valley won the boys 4x100 (45.1) and 4x400 meter relays (3:30.6). For the girls, Caitlyn Bence of Penns Manor won the 100 (13.0) and 200 meter dashes (26.4). Liz Cunningham of Northern Cambria won the 400 meter dash (1:02.0) and the 300 meter hurdles (47.6). Paige Lumley of Richland won the high hurdles (15.39), the intermediate hurdles (46.43), and the triple jump (PA#5 38-4). Alyssa Brandis of Central Cambria won the 1600 (5:26.48) and 3200 meter runs (12:00.49). Jayna Coyle of Somerset jumped 17-3.25 to win the long jump. For the boys, Dan Meyer of Somerset won the 100 (11.62) and 200 meter dashes (23.28). Zac Prohonic of Cambria Heights won the long jump (20-1) and the triple jump (42 feet even). Kim Watterson of Springdale won the 400 (58.29) and 200 meter dashes (25.87). Caitlin Bungo of Sewickley Academy won the 1600 (5:22.23) and 3200 meter runs (11:31.36). Emily Lelis of Springdale won the 100 meter hurdles (15.28) and the 300 meter hurdles (46.19). Bronte Soul of Freeport won the long jump (16-9) and the triple jump (35-2). Anna Frengel of Neshannock threw 38-8.50 to win the shot put. For the boys, Darren Myers of Burrell won the 100 (11.42) and 200 meter dashes (22.81). Alex Archer of Vincentian Academy won the 1600 (4:39.65) and 3200 meter runs (9:58.25). Carrington Motley of Sewickley Academy won the long jump (21-7.75) and the triple jump (43-0.50). Kaleb Kingston of Laurel threw 54-4.50 to win the shot put. Jessie Merckle of Fort Cherry threw 145-6 to win the javelin. Alyssa Wise of Washington won the 100 (12.37) and 200 meter dashes (25.89). Peyton Hampson of Waynesburg Central ran 2:17.69 to win the 800 meter run. Aubrey Hutchinson of Beaver Area ran 46.28 to win the 300 meter hurdles. For the boys, Dustin Fuller of Washington won the 400 meter dash (51.14) and the 300 meter hurdles (40.11). Josef Dipietrantonio of Beaver Area won the 1600 (4:27.96) and 3200 meter runs (9:56.00). Sal Faieta of Bethlehem-Center threw 174-4 to win the javelin. A little bit of thunder and lightning really brought out the electricity at the WPIAL AAA Central Section Qualifier at Norwin, with performances after a nearly hourlong storm delay being the best from a rain-plagued meet. Wil Bailey of Penn Hills did not waste any time, stomping on the accelerator and never looking back in the 800-meter run, the first event after action resumed. His PA#4 1:53.26 erased a 45-year-old school record and was more than 6 seconds up on Kiski Area’s Brent Kennedy and the rest of the field as the senior took care of one of his season goals. Earlier in the meet, Bailey edged Kennedy in the 1,600, posting a season-best 4:24.52 to Kennedy’s 4:25.96. Savon Salter of Penn Hills lowered his PA#8 performance in the 300 hurdles to 38.53 seconds in besting a quality field. Greensburg Salem’s Julian Thompson moved up a spot to No. 6 in the PA triple jump rankings, covering 46 feet, 9.5 inches for the victory, while Albert Gallatin’s Gregory McKay won the long jump at 22-3.75. Tyler Ross of Greater Latrobe was the fastest of a trio under 50 in the 400, crossing the line in 49.36. However, he and teammate Jeff Elam (14.95 in the 110 hurdles) saved their best for last, lifting the Wildcats to victory in an exciting and competitive 1,600 relay. Ross covered a lap in 48.8, and Elam’s anchor leg was clocked in 47.8 as he found his way past and through Penn Hills and then Hempfield Area for the victory in a PA#4 3:21.16. Hempfield Area was the runner-up in a PA#6 3:21.28, while Penn Hills had a season-best 3:22.10. In the girls meet, Greater Latrobe also won an exciting 1,600 relay, with the same three teams finishing in the same order. Winning anchor Hanna Green battled Jasmine Jones of Hempfield Area over the final 100 meters, with the Wildcats first in 4:03.43 and Hempfield Area crossing in 4:03.54. Earlier, Green nipped Christina Roberson of Penn Hills, 57.89 to 57.90, as the top four cracked the minute mark in the 400 dash. Meanwhile, Jones was first in the 100 at 12.77 and shared the top clocking in the 200 at 25.52. Norwin’s Autumn Greba had a pair of victories, with a season-best 5:04.78 in the 1,600 and a 2:18.89 over two laps, while the top eight all cleared 5-0 in the high jump. The top eight finishers in each event advance to the WPIAL (District 7) championship meet May 17 at Baldwin. Hopewell’s Shatori Walker-Kimbrough registered a pair of quality victories in the WPIAL AAA North Section Qualifier at Butler, leading those advancing to next week’s WPIAL championship meet at Baldwin. The junior improved her PA#6 mark in the triple jump with a 38-feet, 1-inch victory, turning back the 37-2.5 from Lydia Dennis of Mars Area and two others over 36-0. Walker-Kimbrough also spanned 17-9.5 in the long jump, leading three others over 17-0. Abby O’Connell of North Hills won the 200- and 400-meter dashes, with her 57.59-second effort nipping the 57.63 from Butler Area’s Jasmine Bailey. Margo Malone of North Hills took the 1,600 and 3,200 runs, while Knoch cleaned up in the long relays, covering the 1,600 in 4:03.94 and the 3,200 in 9:31.15 to turn back North Allegheny in both. In boys action, Torey Doaty of Pittsburgh Central Catholic moved to PA#9 in the 300 hurdles at 38.65, while Oliver Philogene of Seneca Valley ran 49.28 to claim the 400 dash by more than a second. The Raiders closed out the meet in the 1,600 relay with a 3:21.97 clocking and the victory over Central Catholic’s 3:22.18. Other top efforts included Forrest Barnes of Seneca Valley with an 11.07 win in the 100 dash and Fox Chapel Area’s Ethan Martin turning back North Allegheny’s Michael Becich in the 1,600, 4:25.81 to 4:26.45, before losing to Tiger standout Logan Steiner at double the distance, 9:38.74 to 9:39.72. Krista Kuss of Baldwin won the 100 (12.50) and 200 meter dashes (26.21). Dejalynn Peterson of Chartiers Valley ran 57.14 to win the 400 meter dash. Amanda Ruschel of Bethel Park ran 2:16.30 to win the 800 meter run. Beatrice Goodyear of Mount Lebanon won the 100 hurdles (15.29) and 300 meter hurdles (47.03). Bethe Park ran 9:28.71 to win the 4x800 meter relay. Kathleen Davey of Canon-McMillan threw 38-6.50 to win the shot put. Maria Pierce of Laurel Highlands threw 136-6 to win the javelin. For the boys, Billy Stanley of South Park threw 232-11 to win the javelin! Jimmy Wheeler of West Mifflin won the 100 (11.18) and 200 meter dashes (22.91). Darisu Lighty of West Mifflin ran 49.80 to win the 400 meter dash. Shawn Johnson of Canon-McMillan won the high jump (6-0), the long jump (21-7.50) and the triple jump (46-5). Mary Newell of Villa Joseph Marie won the shot put (PA#5 40-6) and the discus (123 feet even). Olivia Rosenberger of Gwynedd-Mercy won the long jump (17-8.25) and the triple jump (35-4.50). Teammate Emma Keenan won the 400 meter dash (56.18) and the 800 meter run (2:18.71). Megan McGarrity of St Basil Academy won the 1600 (5:13.78) and 3200 meter runs (11:21.56). Gwynedd-Mercy ran 48.97 to win the 4x100 meter relay and 3:58.85 to win the 4x400 meter relay. Grace Giampetro of Villa Maria won the pole vault, was runner-up in the 100 hurdles and triple jump, and 4th in the high jump. Jack Huemmler of Strath Haven ran a PA#8 time of 1:54.54 to win the 800 meter run. Teammate Wellington Zaza won the 110 meter hurdles (14.90) and the 100 meter dash (10.97). Andrew Brandt of Marple Newtown cleared 6-6 to win the high jump. Strath Haven won the 4x100 (PA#3 42.27) and 4x400 meter relays (3:22.09). Brandon Waller of Haverford won the discus (145-9) and the javelin (171-4). Praduman Singh of Upper Darby threw 56-5 to win the shot put. For the girls, Grace Galligan of Springfield (Delco) ran 5:09.02 to win the 1600 meter run. Kristen Miller of Strath Haven ran 2:15.71 to win the 800 meter run. Rachel Van Metre of Strath Haven cleared 5-4 to win the high jump. Kalia Cannon of Haverford won the long jump (17-1.25) and the triple jump (35-1.50). Strath Haven ran a PA#6 time of 3:55.82 to win the 4x400 meter relay. Garnet Valley ran 9:27.56 to win the 4x800 meter relay. Megan Ross of Haverford threw 39-8 to win the shot put and 109-8 to win the discus. Kenya Woodall of Coatesville won the 100 (PA#5 12.15), the 200 (25.02), and 400 meter dashes (PA#2 55.81). Michelle Tracy of West Chester Henderson ran 2:15.78 to win the 800 meter run. Meghan Harvey of Oxford ran 5:02.51 to win the 1600 meter run. Kelly Boulger of Coatesville ran 11:03.62 to win the 3200 meter run. Downingtown East ran 9:22.11 to win the 4x800 meter relay. Ellie Pollock of Avon Grove jumped 17-9.25 to win the long jump. For the boys, Perry Hopkins of Unionville won the javelin with a PA#3 and US#5 mark of 208-7! Eric Miller of West Chester Rustin ran 11.00 to win the 100 meter dash. Kevin Smith II of Coatesville ran 22.04 to win the 200 meter dash. Demetrius McCary of Great Valley ran 49.84 to win the 400 meter dash. Aaron Willett of Coatesville won the 110 meter hurdles (14.14) and 300 meter hurdles (37.58). Coatesville ran a PA#5 time of 3:20.52 to win the 4x400 meter relay. Elon Rembert of Great Valley cleared 6-4 to win the high jump. Ryan Hart of Downingtown East threw a PA#2 mark of 189-6 to win the discus. In the Colonial League, Monty Szukics of Palmerton won the 100 (11.10), the 200 (22.27) and 400 meter dashes (50.47). Bryan Pearson of Bangor won the shot put (52-3.25) and the discus (170 feet even). For the girls, Elizabeth Chikotas of Saucon Valley won the 1600 (5:11.75), the 800 (2:20.08), and 3200 meter runs (11:14.81). Jessica Pereira of Palmerton won the 100 (12.83) and 400 meter dashes (59.83). In the Lehigh Valley Conference, Tyler Horton of Bethlehem Catholic ran 14.68 to win the 110 meter hurdles and ran 40.16 to win the 300 meter hurdles. Adam Bridgeforth of Nazareth Area jumped 45-9 to win the triple jump. Nathaniel Palmer of Freedom ran 9:40.03 to win the 3200 meter run. Andrew Wolfe of Easton ran 1:57.78 to win the 800 meter run. For the girls, Damirah Graham of Easton ran a T-PA#3 time of 45.04 to win the 300 meter hurdles. Amy Darlington of Liberty won the 1600 (5:05.11) and 3200 meter run (11:05.46). Kenesha Brown of Easton won the 100 (12.57) and 400 meter dashes (57.95). Julia Molloy of William Allen cleared 11 feet to win the pole vault. Casey Harewood of Liberty cleared 5-4 to win the high jump. Easton ran 49.09 to win the 4x100 meter relay. The girls competition produced three state #1 performances and many other top eight performances. The first athlete to get a PA#1 mark was Amani Nesmith of Swenson. Nesmith won the long jump with a state leading mark of 19-4! 2nd place went to Diamond Hodge of Girls High, who earned a PA#2 mark of 19-2! She also won the triple jump with a mark of 37-1. Nesmith's teammate Amy Hicks earned a PA#1 mark in the 300 meter hurdles with a winning time of 44.13. She also added a PA#2 mark in the 100 meter dash in a time of 11.96, and a PA#2 mark in the 100 meter hurdles with a winning time of 14.63! Her teammate Tichina Rhodes was 2nd in the race with a time of 44.79. Ceaira Brown of Overbrook took over the state lead in the 400 meter dash with a time of 55.59! She also ran 2:15.24 to win the 800 meter run. Imani Harris-Quillen of Swenson ran a PA#5 time of 25.02 to win the 200 meter dash. She also finished 2nd in the 400 meter dash with a PA#5 time of 56.65. For the boys, Niager Mathis of Swenson completed the sprint triple, winning the 100 meter dash in a T-PA#4 time of 10.76, the 200 meter dash in 21.99, and the 400 in 50.37. Swenson ran 3:23.03 to win the 4x400 meter relay. Keith Fletcher of Northeast cleared 6-4 to win the high jump. Naje Benton of Franklin Towne Charter won the long jump with a PA#3 mark of 23-4. Michael Turner of Engineering and Science threw 52-6 to win the shot put. Brendan Shearn of North Schuylkill won the 1600 (4:26.02) and 3200 meter runs (9:29.54). Shavinski Thomas of Pottsville cleared 6-5 to win the high jump. Pervis Johnson of Jim Thorpe won the long jump with a mark of 22-9.75. For the girls, Paige Stoner of Pottsville won the 1600 (5:13.42) and 3200 meter runs (11:14.00). Christine Streisel of Tamaqua won the shot put (37-4.25) and the javelin (150-10). Cecil Simpson of Upper Darby won the long jump (21-5) and the triple jump (41-4). Dion Durnell of Penncrest ran 22.6 to win the 200 meter dash. Daniel Stewart of Strath Haven ran 1:59.7 to win the 800 meter run. Ryan Smathers of North East won the 1600 (4:19.91) and 800 meter runs (1:57.87). Kevin Gardner of Fort Leboeuf cleared 6-5 to win the high jump. Kyle McKeen of Northwestern jumped 45-1 to win the triple jump. For the girls, Eve Gardener of Union City won the 100 (12.78), 200 (26.06), and 400 meter dashes (1:00.81). Andrea Miller of Fairview won the 1600 (5:29.21) and 800 meter runs (2:25.22). Kristen Markiewicz of Harbor Creek won the long jump (16-10.25) and the triple jump (35-1.50). Daryl Worley of Penn Charter won the 100 (11.21), the 400 (49.42), and 200 meter dashes (22.27). Dustin Wilson of Chestnut Hill Academy won the 1600 (4:18.17) and 3200 meter runs (9:36.46). Tom Pitt of Malvern cleared 6-6 to win the high jump, jumped 22-3.25 to win the long jump, and jumped 42-2.50 to win the triple jump. For the girls, Megan McCloskey of Germantown Academy cleared a state leading and T-US#10 mark of 5-9 to win the high jump. Maria Seykora of Notre Dame won the 1600 (PA#8 4:57.30), the 800 (2:17.69) and 3200 meter runs (11:34.48). Katelyn Jackson of Springside won the 100 (12.22) and 200 meter dashes (25.04). DeShaun Pickett of Girard College won the 100 (11.08) and 200 meter dashes (22.67). For the girls, Shakeira Fowler of Girard College also won the 100 (12.91) and 200 meter dashes (26.64). Will Graham struck gold four times as District 8 (Pittsburgh City League) became the first district to wrap up its 2012 season in a two-day meet. The Allderdice standout won a pair of field events on Thursday and then returned Saturday for two more individual victories on the track. Graham was a convincing winner in both hurdle races, slipping over the 110-meter barriers in a near-season-best clocking of 15.25 seconds and claiming the 300 hurdles in 42.73. On Thursday evening at the Oliver High School oval, he scaled 6 feet, 4 inches in the high jump and was the lone competitor over 40 feet in the triple jump. He was one of four double winners in the boys’ running events as Obama Academy’s Eddie Harris (11.17 and 23.30) topped the dashes, Allderdice’s Darius Moore turned in the 400-800 double and teammate Ean DiSilvio (4:31.26 in 1,600) crossed the line first in the distance races. In the girls meet, Obama Academy’s Karla Simmons had a 59.78 clocking as part of a 400-800 double, and teammate Brandy Brooks claimed both hurdle events (16.12 in 100 hurdles). Obama’s Kaleah Rose had a 12.71 in the 100 dash, and Kayla Key of Westinghouse won the 200 in 26.58. Allderdice easily claimed both team titles, with the boys more than doubling the runner-up and the girls winning by 20 points. Aisha Newsome of Brookville won the 100 meter hurdles (15.5) and the 300 meter hurdles (T-PA#6 44.9). Sister Lanae Newsome won the 100 meter dash (12.3), the 200 meter dash (25.5) and the triple jump (38-3.25). Mckenna Spence of Cranberry won the 1600 (5:21.8) and 800 meter runs (2:23.9). For the boys, Bryce Straffin of Clarion ran 49.2 to win the 400 meter dash and ran 22.5 to win the 200 meter dash. Ryan Kerr of Brookville Area threw 182-9 to win the javelin. Molly Davies of Lower Moreland ran 5:16.87 to win the 1600 meter run. Carrie Gehman of Christopher Dock won the 3200 (11:29.04) and the 800 meter run (2:21.11). For the boys, Ryan Horgan of Holy Ghost Prep ran 1:57.39 to win the 800 meter run. Teammate Zack Israle ran 9:41.14 to win the 3200 meter run. Teammate Jess Ainsley won the high hurdles (15.40), the high jump (6 feet even) and the long jump (20-8.50). 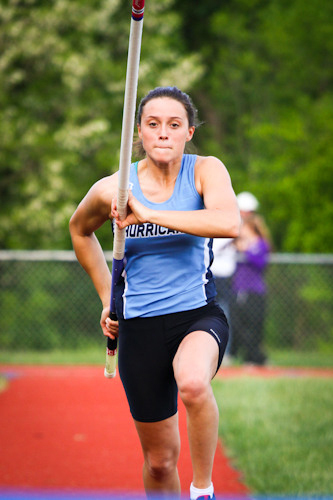 Sarah Helgeson of Hempfield (3) won the 100 (T-PA#3 12.01), the 200 (PA#4 24.94) and 400 meter dashes (PA#6 56.34). Greta Lindsley of Penn Manor won the 1600 (5:09.59), 800 (2:14.93), and 3200 meter runs (11:32.81). Mary Witmer of Ephrata ran a PA#3 time of 44.66 to win the 300 meter hurdles. She also won the triple jump with a mark of 37-11.50. Sarah Fairbanks of Elizabethtown won the shot put (39-8.50) and the discus (126-11). For the boys, Drew Gerberich of Eastern Lebanon ran 1:55.76 to win the 800 meter run. Robert Cardina of Conestoga Valley won the high hurdles (PA#6 14.33) and the intermediate hurdles (38.90) as well as clear 6-8 in the high jump. Conestoga Valley ran 3:22.70 to win the 4x400 meter relay. Cedar Crest ran 7:59.63 to win the 4x800 meter relay. Max Mahan of Garden Spot also cleared 6-8 in the high jump. Kyle Felpel of Cocalico threw 60-1.50 to win the shot put. Kyle Long of Hempfield threw 193-1 to win the discus. Cole Proffitt of Manheim Central threw a PA#7 mark of 200-7 to win the javelin. Kara Steinke of Methacton won the 1600 (4:59.64) and 3200 meter runs (10:47.37). 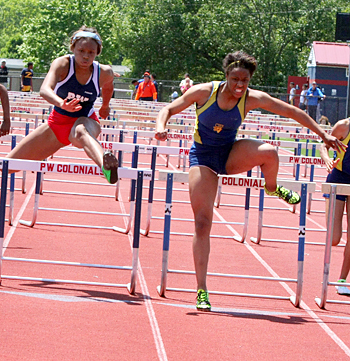 Quiana McIntosh of Pottstown ran a PA#3 time of 44.67 to win the 300 meter hurdles. Holly Sullivan of Owen J Roberts won the 200 (25.93), the 400 (PA#6 56.37) and the long jump (17-2). For the boys, Ronnie Gillespie of Upper Perkiomen won the 100 (11.00) and 200 meter dashes (21.96). Brett Kelly of Boyertown won the 1600 (4:23.69) and 3200 meter runs (9:51.25). Spring Ford ran a PA#5 time of 7:55.11 to win the 4x800 meter relay. Misohn Coppock of Pottstown cleared 6-6 to win the high jump. Teammate Corey Baker jumped 22-8 to win the long jump. Jody Ann Evans of Quakertown won the 100 meter dash in a PA#3 time of 12.01. Natalia Pinkney of Pennridge ran a PA#3 time of 24.77 to win the 200 meter run. Tori Gerlach of Pennridge improved on her state leading mark in the 3200 meter run with a winning time of 10:33.33. Meghan McGovern of North Penn was 2nd with a PA#2 time of 10:34.81. Veronica Eder of Central Bucks East ran a PA#6 time of 10:49.75 to finish 3rd. Marissa Sheva of Pennridge ran a PA#5 time of 4:54.98 to win the 1600 meter run and ran 2:14.76 to win the 800 meter run. Sydnee Jacques of North Penn won the high hurdles (14.78) and the intermediate hurdles (PA#4 44.98) as well as the triple jump (37-1.75). Central Bucks West ran 3:53.15 to win the 4x400 meter relay. Pennridge finished 2nd in a PA#5 time of 3:55.02. Central Bucks South was 3rd with a PA#7 time of 3:55.69. Pennridge ran a PA#3 time of 9:18.12 to win the 4x800 meter relay. For the boys, Sam Hibbs of Hatboro Horsham ran a PA#2 time of 4:15.96 to win the 1600 meter run. Chris Trimble of North Penn ran a PA#4 time of 4:17.00 to finish 2nd. Nico Metzler of Central Bucks West ran a PA#8 time of 4:17.57 to finish 3rd. Corey Hackett of Hatboro Horsham won the 100 (PA#6 10.79) and 400 meter dash (49.16). Pennridge ran a PA#3 time of 7:51.94 to win the 4x800 meter relay. Ryan Hynes of Central Bucks South ran a PA#7 time of 38.09 to win the 300 meter hurdles. Austin Kohler of Pennridge ran 1:54.42 to win the 800 meter run. Corey Smith of Central Bucks West cleared 14-6 to win the pole vault. Zayna Milligan of Norristown won the 100 (12.44) and 200 meter dashes (PA#4 24.87). Kayla Coley of Cheltenham won both hurdle events with state leading times. She won the high hurdles in 14.43 and the 300 meter hurdles in 43.28. Norristown ran a PA#4 time of 47.94 to win the 4x100 meter relay. Taylor Morgan of Upper Dublin cleared 5-6 to win the high jump. She also finished 2nd in the 300 meter hurdles in a PA#4 time of 44.98. Francis Marquis of Cheltenham ran 45.03 to finish 3rd and earn PA#5 honors. Ebony Grasty of Wissahickon jumped a T-PA#8 mark of 38-1 to win the triple jump. For the boys, Tyler Whitmore of Upper Moreland won the 100 (10.92) and 200 meter dashes (21.89). Drew Magaha of Upper Moreland ran 1:55.42 to win the 800 meter run. Maxmilian Hairston of Cheltenham won the 110 meter hurdles (PA#5 14.22) and the 300 meter hurdles (PA#7 38.33). 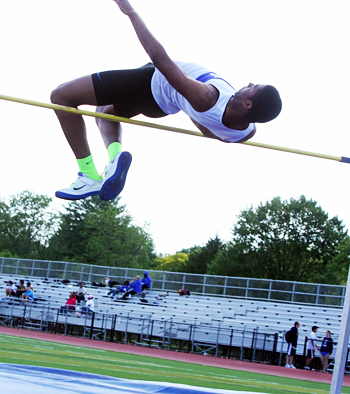 Jalen Ramsey of Norristown cleared 6-9 to win the high jump. Harley LaCroix of Cheltenham won the long jump (22-1) and the triple jump (45-5.25). Jordan Matthews of Abington won the long jump with a T-PA#4 mark of 18-11 to win the long jump. She also ran 57.27 to win the 400 meter dash. Zakiyyah Richardson of Pennsbury won the 100 (PA#8 12.14) and 200 meter dashes (25.09). Pennsbury ran 3:55.93 to win the 4x400 meter relay. For the boys, Paul Wahlman of Council Rock North ran 38.87 to win the 300 meter hurdles. Qhyle Elijah of Bensalem ran a PA#7 time of 48.61 to win the 400 meter dash and 22.11 to win the 200 meter dash. Neshaminy ran 42.04 to win the 4x100 meter relay. Cody Mining of Neshaminy won the long jump with a PA#8 mark of 22-10 to win the long jump. Seyram Avakame of Bensalem jumped 45-2.75 to win the triple jump. Angelica Gonzalez of Red Lion won the 100 (12.27) and 200 meter dashes (PA#4 24.79). Megan Lundy of Central York ran a T-PA#7 time of 24.99 to finish 2nd. Lundy did run 57.71 to win the 400 meter dash. Sally Trout of Dallastown won the high hurdles (15.11) and the intermediate hurdles (46.11). Jamila Janneh of New Oxford won the long jump (16-8.50) and the triple jump (37-4). For the boys, Jay Stone of Central York won the high hurdles (14.77) and the intermediate hurdles (39.41). Jared Allison of Dallastown cleared 15-6 to win the pole vault. Jared Posey of William Penn jumped a PA#5 mark of 47-1.25 to win the triple jump. Sam Koimene of Central York ran 10.95 to win the 100 meter dash. Skylar Dantzler of Wilson (3) won the 100 (12.47), 200 (25.54), and 400 meter dashes (59.50) as well as the long jump (16-8.50). Tessa Mundell of Governor Mifflin won the 1600 (5:02.78) and 3200 meter runs (11:13.75). For the boys, Imani Brown of Reading won the triple jump with a PA#1 and US#6 mark of 49-11.50! He also won the long jump with a PA#4 mark of 23-3.75. Thomas Taylor of Wyomissing ran a state leading time of 21.31 to win the 200 meter dash. Jared Horne of Schuylkill Valley cleared 6-7 to win the pole vault. Wilson (3) ran 3:22.43 to win the 4x400 meter relay and ran a PA#3 time of 42.45 to win the 4x100 meter relay. Jimmy Brooks of Wilson (3) ran 48.71 to win the 400 meter dash. Morgan Richards of Hickory ran 5:01.19 to win the 1600 meter run and 11:20.77 to win the 3200 meter run. Eliza Lowe of Grove City Area won the high hurdles (15.15) and the intermediate hurdles (46.18). Lauren Lubarski of Hickory cleared 5-5 to win the high jump and threw a PA#7 mark of 138-11 to win the javelin and finished 2nd in the discus with a PA#2 mark of 141-4. Rebekah Petty of Greenville cleared 11-6 to win the pole vault. Jennifer Neider of Hickory led a 1-2-3 finish in the shot put with a mark of 45-4. Taylor Woods was 2nd with a PA#3 mark of 42-3. Woods did the discus with a mark of 146-2. For the boys, Dan Jaskowak of Grove City Area ran 1:55.29 to win the 800 meter run. Jeremy Jancso of West Middlesex cleared 6-8 to win the high jump and won the long jump with a mark of 22-3.50. Matt Bell of Hickory threw 60-2.25 to win the shot put and 168-11.50 to win the discus. DeShawn Coleman of Hickory won the 100 (11.23) and 200 meter dashes (23.42). Brittany Burg of Mercersburg ran 1:05.28 to set a meet record in the girls 400 meter hurdles. Mercersburg ran 4:08.82 to win the 4x400 meter relay. Sarah Firestone of Mercersburg threw 128-4 to win the javelin. For the boys, Quinn Davis of Hill School ran 4:18.37 to win the 1600 meter run and 9:59.40 to win the 3200 meter run. Zack Holzwarth of Mercersburg cleared 11-6 to win the pole vault. Marshay Ryan of Chambersburg won the triple jump with a PA#1 and US#10 mark of 40-5! She also won the long jump with a mark of 18-7.50. Olivia Loy of Cedar Cliff cleared 11-6 to win the pole vault. Central Dauphin East ran 47.90 to win the 4x100 meter relay. Rachael DeCecco of Cumberland Valley ran 45.29 to win the 300 meter hurdles. Teammtae Carol Strock ran 5:02.06 to win the 1600 meter run. Deme'shia Davis of Central Dauphin East won the 100 (12.35) and 200 meter dashes (25.33). Katlin Gould of Cedar Cliff ran a T-PA#7 time of 56.77 to win the 400 meter dash. For the boys, Bobby Smutsky of Northern ran a PA#8 time of 21.88 to win the 200 meter dash. Lindell Swinson of Milton Hershey ran a PA#2 time of 48.21 to win the 400 meter dash, while teammate Almany Bangura ran a PA#8 time of 48.72 to finish 2nd. Vinny Todaro of Big Spring ran a PA#4 time of 4:17.38 to win the 1600 meter run. Milton Hershey ran a PA#6 time of 42.43 to win the 4x100 meter relay. Cumberland Valley (7:49.61) and Chambersburg (7:50.05) finished PA#1 and PA#2 in the 4x800 meter relay. Ibn Short of Milton Hershey cleared 6-8 to win the high jump. Shawn Mayer of Palmyra cleared 15-7 to win the pole vault. Robert Doster of Middletown threw 193-2 to win the javelin. Rebecca Warriner of Northern Potter won the 100 (13.49), the 200 (27.10), and 400 meter dashes (1:00.20). For the boys, Kalil Slaughter of Sheffield won the 100 (11.07) and 200 meter dashes (22.30) as well as the long jump (20-0.50). Barrett Kemp of Oswayo Valley won the 1600 (4:36.21) and 3200 meter runs (10:20.99). Nick Conway of Port Allegheny won the high hurdles (15.26) and intermediate hurdles (40.25). Teammate Trevor Neal cleared 6-4 to win the high jump. Erika Huffman of Wyalusing Valley won the 1600 (5:13.53) and 800 meter runs (2:23.08). Taylor Acorn of Wellsboro won the 100 (13.01) and 200 meter dashes (26.43). For the boys, Jordan Jackson of Wellsboro won the 1600 (4:32.06) and 800 meter runs (1:58.27). Greg Hildebrandt of Towands cleared 14-6 to win the pole vault. Elyse Skerpon of Sayre won the high hurdles (16.20) and intermediate hurdles (47.10). Kelsey Carsen of Northeast Bradford won the shot put (34-8) and the javelin (131-6). For the boys, Riley Card of Sayre cleared 6-5 to win the high jump. Teammate Jesse Dagutis won the 100 (11.00) and 200 meter dashes (23.00), and also won the long jump (20-2) and the triple jump (42-1.50). 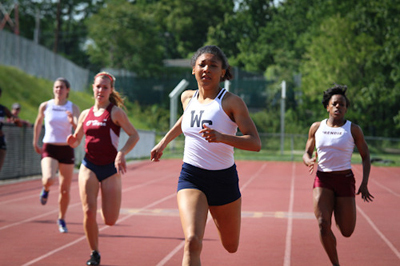 Jada Steward of West Catholic won the 100 (PA#8 12.11) and 200 meter dashes (PA#2 24.75). Rachel Flynn of Archbishop Carroll won the mile (5:09.78) and the 800 meter runs (2:17.22). Kelly Hooven of St Hubert's won the long jump with a mark of 17-7.50. Logan Brenker of Conwell-Egan capped her PCL career with her fourth straight triple jump title, leaping a season-best 36-03.50. For the boys, Matt Smalley of Father Judge won the 100 (10.86) and 200 meter dashes (22.19). Tom Coyle of Lasalle won the mile (4:22.38) and the 3200 meter runs (9:39.45). Todd Townsend of West Catholic won the high hurdles (14.62) and intermediate hurdles (38.97). Mike DeCandido and Mike Koller of Lasalle both cleared 6-6 in the high jump. 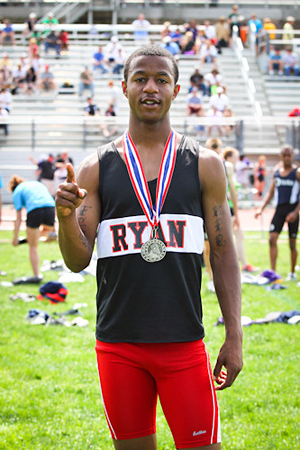 Tyrek Edwards (left in photo) of Archbishop Ryan improved on his state lead in the long jump with a mark of 23-7. He also won the triple jump with a PA#5 mark of 47-1. Chazz Wilks of Cardinal O'Hara won the shot put (54-1.50) and the discus (167-2). Rachel Fatherly of Williamsport won the shot put (44-1) and the discus (136-1). Ellen Shepard of Central Columbia won the 100 (12.55) and 200 meter dashes (25.73). Alison Billas of Danville won the 1600 (5:13.03) and 3200 meter runs (11:33.87). Virginia LaMacchia of Central Columbia won the high jump (5-2) and the pole vault (11-6). For the boys, Devon Fisher of Williamsport won the 100 (11.21) and 200 meter dashes (22.63). John Santangelo of Shikellamy jumped 22-7 to win the long jump. Katie Cassidy of St Basil Academy ran 2:19.14 to win the 800 meter run. For the boys, Jesse Rogers of West Chester East ran 4:30.25 to win the 1600 meter run.